This month has been crammed full of stuff! I swear I don't know when we will get around to the yard, since we usually plant the garden the first weekend of May and that's coming soon. Dave ran in a half marathon last weekend! He injured his leg the week of, so all things considering he did a great job. He finished just under two hours. The boys had a fun time cheering him on, and were fascinated to find out the race had free face painting and balloon animals after. There was also guest appearances by Spiderman, Captain America, a Jedi, Elsa & Anna. They had this because there was a kids race at 11. Logan decided he wouldn't mind racing next year. We'll see if he feels the same then, and we can sign him up. It's only like $5 to run, and he gets a shirt too, so not too pricy. I picked up some sew from home work this week. I initially thought it was going to be a one time thing, but it sounds like the lady is looking for help until July or August, so I've told her I'll do a few hours a day. It will be nice to have some extra money coming in, even if I don't have a plan for it right now (I'm thinking a family trip to the beach, or remodel the basement bathroom... or just pay off baby #3's medical bills... we'll see). I'm making bags for tent polls and end up making around $15 and $20 an hour, depending on how fast I sew because I'm paid by the piece. This weekend we took a long weekend and headed down to St George area to camp, hike, and visit with my Mom's side of the family. 9 out of the 10 siblings were there, some of their spouses, and my Grandparents were all there. Many of my cousins weren't able to make it, but with a smaller group, we got to visit more with everyone that was there which was so nice. The boys had so much fun hiking and were very proud of themselves for hiking to the top of several mountains, into caves, lava tubes, and to Moqui Marble Heaven (as they and their cousin's named the top of one particular hike). Mike and Alison were there Friday and most of Saturday. The boys had so much fun playing and hiking with their cousins! We were sad to see them go home early. They collected TONS of rocks! As I keep unpacking more bags, I find more and more. Every tupperware container that was empty was filled when I opened them. Which is quite impressive since they had to unzip the bag they were in, fill them, put the lids on the tupperware, and zip the bag back up. Friday night we had some kind of freak wind storm that blew ours and about 4 other tents over. Our center metal tent poll snapped in half so we were up at 2 am trying to fix it so we could get some sleep. We didn't get a lot of sleep that night. Fortunately we just bought our tent at REI and they have a 1 year return policy. So after one camping trip, it will be headed back to the store. Sigh! I really liked that tent. The ride home was rough, and the cleanup/unpacking/4 loads of laundry were intense, but all and all a great weekend. Now to plan a summer vacation. Dustin has been potty training! Most days he goes without accidents, but when he wants attention or when he is lazy he has accidents. So work in progress, but pretty good for the first week. He does know what he's doing, it's just a matter of convincing him this is the thing to do. The weather has been so nice we have enjoyed playing outside. We even went on a trip to Murray Park. The boys love to run around and enjoying nature! So it was fun times. Last weekend we went to Dave's parent's house for an Easter egg hunt with the cousins. The boys had fun and found tons of eggs! 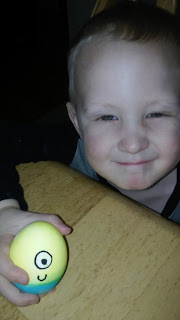 Logan told me later Saturday he didn't know Papa hid eggs, he thought it was just the Easter Bunny. Easter was a fabulous day too. We woke up and found baskets (Dustin ate so much candy that I had to put up the baskets), we went to church, enjoyed lunch/dinner, and went on a long walk. We stopped by a friend from the ward's house and the boys played with their boys for a while. The family have 3 boys (5, 3, and 18 months) and she's pregnant with a little girl too, so we have a lot in common, and they're just fun. This week we've been getting back into the swing of things. Cleaning up from all the lack of cleaning potty training week, making more freezer meals, etc. I tried a few new freezer recipes and made a total of 18 dinners and freezer garlic bread. I want to have some tasty recipes on hand so we can fill up the freezer for when the baby is born. Our friends the Montgomery's came to visit us from Logan on Thursday! 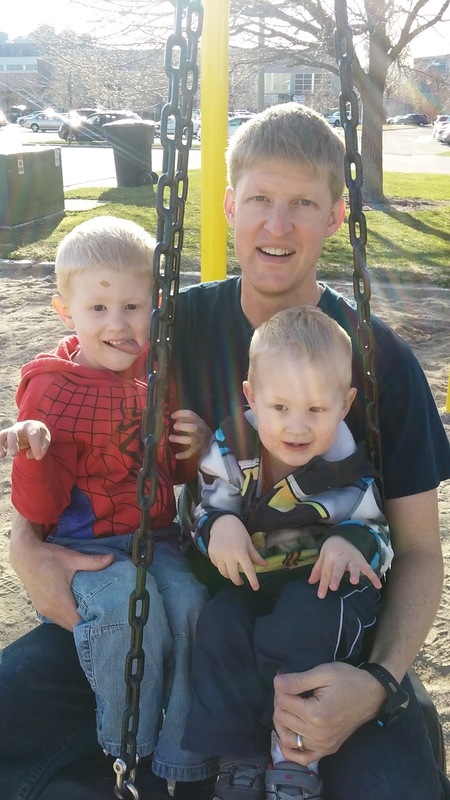 The boys played and played with their two kids. They have a little girl that's almost a year old and Dustin couldn't believe she was crawling. Infact he was CONVINCED she wasn't big enough to crawl, so he would crawl right behind her (almost on top of her) and make sure she didn't fall over. It was cute, and eventually he accepted that she wasn't going to hurt herself. Friday we got a 3 yard load of wood chips for our yard. That night we spread half of it and we plan to to finish up Saturday between Conference sessions. I'm hoping this will mean we don't have to weed this year. The boys think the pile of wood chips is the best toy ever! They help us by climbing up it to see how tall it is, and they have their sand shovels to help us fill up the wheel barrel. We learned a new anatomy term recently that Logan wanted me to share, it's philtrum. It's the dent below your nose and above your lip. He's pretty entertained that there's a term for it.